At the end of last year, New York-based WeWork had more than 400,000 members worldwide paying for access to its shared or flexible office space, more than twice the number a year ago. The company said 43 percent of its revenue for the fourth quarter of 2018 came from outside the U.S.
That international growth helped the company more than double its sales to $1.82 billion in 2018 from a year earlier. Over the same period, WeWork’s losses also more than doubled to $1.93 billion. WeWork, a private company, is not required to share financial performance details, but it has discussed select metrics several times in the past year, including its end-of-year results for 2017. 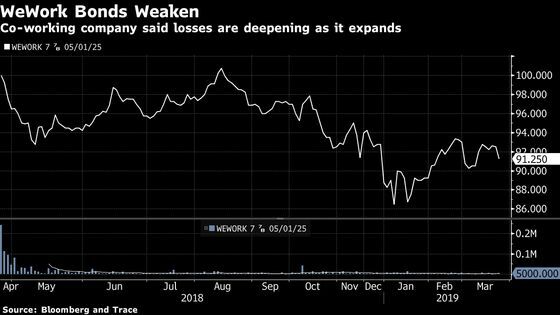 The company has sometimes timed financial discussions with announcements of fundraising deals from SoftBank Group Corp., its biggest investor, including when WeWork raised a $1 billion convertible note and a $3 billion warrant from the Japanese conglomerate. The deal had its costs, however. In its financial report, WeWork detailed a $46 million expense for “transaction fees and inventory write-off,” which Minson said included fees for bankers and other costs related to the SoftBank transaction late last year. It also includes inventory for building materials that WeWork owns but no longer plans to use in construction.